Take the underground U2 from the airport towards Röthenbach. Change at Nürnberg Hauptbahnhof and take the U1 towards Fürth-Hardhöhe until you reach Eberhardshof. Then follow the Fürtherstraße to the “Auf AEG” area. Turn right into Hof A and continue into Hof C. The Chair for Energy Process Engineering is located in Building 2 (see the figure below). Take the exit “Nürnberg / Fürth” on the motorway A73 (“Frankenschnellweg”) and turn left into Fürtherstraße. After the furniture store Mömax, turn left into Muggenhofer Straße and follow the road until you see a building with the inscription “Auf AEG” on the right side. Turn right, directly before this building, through the gate into the inner courtyard C. Unfortunately, there is only limited parking space available in front of the chair in building 2. 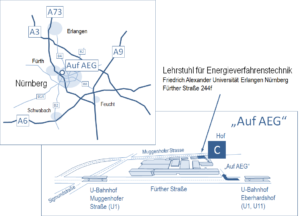 Alternatively, a bigger car park, free of charge, is available 250 meters away in Muggenhofer Straße (opposite house number 141-147).